In this 9-part video lecture series, senior Hartman Institute faculty members delve into the idea of Jewish Peoplehood - its complex origins, its implications and how it might be sustained. An issue of wide concern in the Jewish community today, the concept of a “Jewish collective” appears at odds with a contemporary ethos of intense individualism. 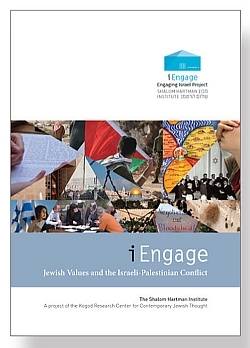 As the meanings and implications of Jewish Peoplehood have a direct impact on nearly all of the central questions and tensions of Judaism and modern life, anxiety about a dwindling sense of Peoplehood is increasingly defining the agenda for Israeli agencies and Jewish institutions and federations worldwide. Source Book: Including all texts referenced in the lectures, plus additional supplementary sources and recommended background readings. The package includes one book for the leader; additional books for participants may be purchased for $20 each including shipping. Leader’s Guide: Lecture summaries, suggested questions for guiding hevruta study and group discussion, supplementary source descriptions, and advice on structuring and teaching the course.